The Flower Child, now available in hardback, is about a young flower child that loses her best friend. Did you ever lose a friend when you were a child? If you did, or if one of your children did, you can understand this can be a terrible and stressful event. Children lose friends due to relocation, divorce, illness or even death. Some might blame themselves for the loss and they need emotional support to help them understand and deal with the loss. This is a wound that can last for many years. In ‘The Flower Child – La Niña Flor,’ Dashi has lost her best friend, Rousseau the Rose. Rousseau is never coming back and Dashi will have to live with that fact. The story helps young children learn to handle this type of loss and demonstrates, as hard as it seems, that life goes on and new friends are made. The book has a very happy ending; a young child in this situation will benefit from the optimistic perspective. Deborah has also illustrated the book with beautiful whimsical watercolors. She has a very personal style. ‘The Flower Child – La Niña Flor,’ is bilingual, English – Spanish, so it will be an excellent resource for a little one growing up in a bilingual and/or bicultural household. 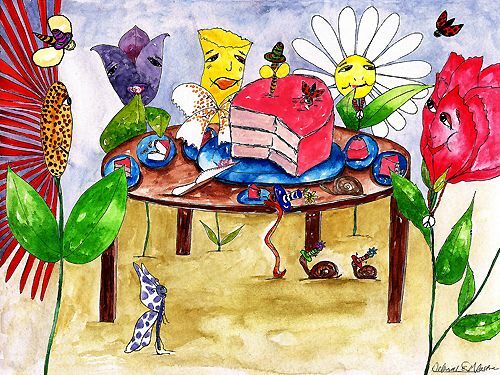 ‘The Flower Child – La Niña Flor,’ written and illustrated by Deborah Eve Alastra, will be exhibited at the International Bologne Children’s Book Fair this March, in Bologne, Italy. Read, ‘The Flower Child – La Niña Flor,’ if you and your family like a story with a happy ending that shares an important message. And seriously, who doesn’t like a story with a happy ending?? This story will soon be available also as an interactive eBook app. The Flower Child es un libro de pasta dura que nos narra la historia de una niña flor que pierde a su mejor amigo. ¿Alguna vez perdiste un amigo en tu infancia? Si te sucedió a ti o a alguno de tus pequeños, podrás entender que esto puede ser un evento terrible y estresante. Los niños pierden amigos debido a la reubicación, el divorcio, la enfermedad o incluso la muerte. Algunos pueden culparse a sí mismos por la pérdida e incluso pueden llegar a necesitar apoyo emocional para ayudarles a entender y lidiar con la pérdida. Esta es una herida que puede durar por muchos años. En ‘The Flower Child – La Niña Flor’, Dashi ha perdido a su mejor amigo, Rousseau la Rosa. Rousseau nunca va a volver y Dashi tendrá que aprender a vivir con ese hecho. La historia ayuda a los niños pequeños a aprender a manejar este tipo de pérdidas y demuestra, aunque parezca muy duro, que la vida sigue y que se pueden hacer nuevos amigos. El libro tiene un final muy feliz; un niño en esta situación se beneficiará de la perspectiva optimista. Deborah también ha ilustrado el libro con sus bellas acuarelas. Tiene un estilo muy personal. ‘The Flower Child – La Niña Flor,’ es bilingüe, en inglés y español, por lo que será un recurso excelente para un pequeño que está creciendo en un hogar bilingüe o bicultural. ‘The Flower Child – La Niña Flor,’ escrito e ilustrado por Deborah Eve Alastra, se exhibirá en la Feria Internacional del Libro Infantil de Bolonia en marzo, en Bolonia, Italia. Lee, ‘The Flower Child – La Niña Flor,’ si a ti y a tu familia les gusta leer una historia con un final feliz y que comparte un mensaje importante. Y en serio, ¿a quién no le gusta una historia con un final feliz? Este relato pronto estará disponible también como una aplicación interactiva para libros electrónicos. This entry was posted in Children books and tagged Children books, ebook review on February 8, 2014 by Jose Luis Cortes. What a beautiful book. And lovely illustrations. Had a friend who committed suicide at age thirteen. No one would have ever guessed she was depressed. Love that this book explores the topic yet has a happy ending! Wow, I think that depression these days can be easily undetected. Specially in teens. I guess we really need to watch out for our kids. Thanks for sharing!